This article is about the historical coinage called "florin". For other uses, see Florin (disambiguation). The Florentine florin was a coin struck from 1252 to 1533 with no significant change in its design or metal content standard during that time. It had 54 grains of nominally pure or 'fine' gold (3.5368 grams, 0.1125 troy ounce) with a purchasing power difficult to estimate (and variable) but ranging according to social grouping and perspective from approximately 140 to 1000 modern US dollars. The name of the coin comes from the flower of the Giglio bottonato, which is represented at the head of the coin. 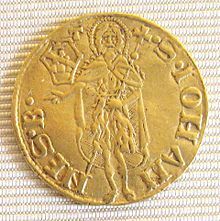 The "fiorino d'oro" of the Republic of Florence was the first European gold coin struck in sufficient quantities since the seventh century to play a significant commercial role. As many Florentine banks were international supercompanies with branches across Europe, the florin quickly became the dominant trade coin of Western Europe for large-scale transactions, replacing silver bars in multiples of the mark (a weight unit equal to eight troy ounces). In the fourteenth century, a hundred and fifty European states and local coin-issuing authorities made their own copies of the florin. The most important of these was the Hungarian forint, because the Kingdom of Hungary was a major source of European gold (until mining in the New World began to contribute to the supply in the sixteenth and seventeenth centuries, most of the gold used in Europe came from Africa). The design of the original Florentine florins was the distinctive fleur-de-lis badge of the city on one side and on the other a standing and facing figure of St. John the Baptist wearing a hair shirt. On other countries' florins, the inscriptions were changed (from "Florentia" around the fleur, and the name of the saint on the other), and local heraldic devices were substituted for the fleur-de-lis. Later, other figures were often substituted for St. John. On the Hungarian forints, St. John was re-labelled St. Ladislaus, an early Christian king and patron saint of Hungary, and a battle axe substituted for the original's sceptre. Gradually the image became more regal looking. The weight of the original fiorino d'oro of Florence was chosen to equal the value of one lira (i.e. a nominal silver pound of 20 soldi or 240 denari) in the local money of account in 1252. However, the gold content of the florin did not change while the money of account continued to inflate; by 1500, a florin was worth seven Florentine lire. The values of other countries' money continually varied against each other, reinforcing the florin's utility as a common measure of value for foreign exchange transactions. The word florin was borrowed in many other countries: for example, the Dutch guilder (abbreviated to Fl. or ƒ), as well as the coin first issued in 1344 by Edward III of England – then valued at six shillings, composed of 108 grains (6.99828 grams) of gold with a purity of 23 carats and ​3 1⁄2 grains (or ​23 7⁄8 carats) – and more recently relating to a British pre-decimal silver coin (later nickel silver) also known as a two shilling (or two bob) "bit" (abbreviation 2/-) worth 24 pence or one-tenth of a pound. Recent research indicates that the florin was once the dominant currency of Europe until accommodative policymaking led to the loss of its status as the continent's de facto reserve currency. A regional variant of the florin was the Rheingulden, minted by several German states encompassing the commercial centers of the Rhein (Rhine) River valley, under a series of monetary conventions starting in 1354, initially at a standard practically identical to the Florentine florin (98% gold, 3.54 grams). By 1419, the weight had been slightly reduced (to 3.51 grams) and the alloy was substantially reduced (to 79% gold). By 1626, the alloy had been slightly reduced again (to 77% gold), while the weight was more substantially reduced (to 3.240 grams). In 1409, the Rheingulden standard (at the time 91.7% gold) was adopted for the Holy Roman Empire's Reichsgulden. ^ Bernocchi, Mario (1976). Le monete della repubblica fiorentina. III. Leo S. Olschki Editore. p. 66. ^ Bazzicchi, Oreste (2011). Il paradosso francescano tra povertà e società di mercato. Effatà Editrice. p. 98. ISBN 978-88-7402-665-4. ^ John S. Dye (1883). Dye's coin encyclopædia: a complete illustrated history of the coins of the world ... Bradley & company. p. 761. Retrieved 22 February 2012. ^ Palgrave, Sir Robert Harry Inglis (1912). Dictionary of political economy. Macmillan and Co. p. 82. Retrieved 22 February 2012. ^ W. A. Shaw (1967) . The History of Currency 1252–1894 (reprint of second ed.). New York: Augustus Kelley. LCCN 67020086. Peter Spufford (1988). Money and its use in medieval Europe. Cambridge University Press. ISBN 0-521-37590-8. Peter Spufford (1986). Handbook of Medieval Exchange,. Royal Historical Society, London. ISBN 0-86193-105-X. Wikisource has the text of the 1911 Encyclopædia Britannica article Florin. Wikimedia Commons has media related to Fiorino.